An important part of any story is the environment that it is constructed in. Without a set environment, the reader will not feel as if they are contained within the story; which will lead to them being disconnected. Ensuring that the reader is connected to your story is the main objective of an author. When a reader feels connected, it is more likely that they will enjoy the story. There are three main sections that are involved in describing the environment; when the story occurs, where the story occurs and the surroundings. 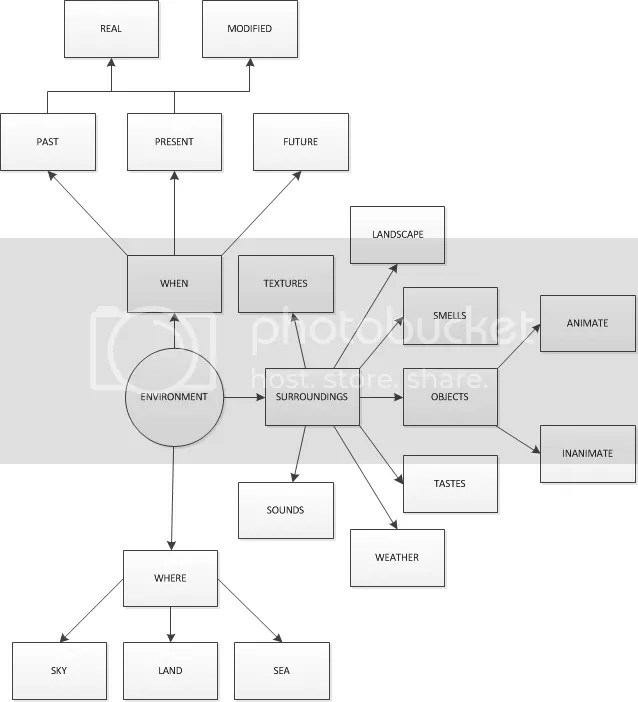 Below is a mind map of what aspects of the environment I feel should be included in a story. The timing of the story is quite important. This will impact upon both the location and the surroundings contained within the story. It can be either set in the past, present or future. The next consideration is whether the past or present savings are to be based on facts or are they to be created through fiction. The next thing to consider is where the story is to unfold. There could be multiple locations contained within the story and these will need to be explained well so that the reader can understand the environment that surrounds the characters. It’s no good telling the reader about the surroundings if they’re unsure exactly where it is taking place. These descriptions give the environment depth. Explanations of sounds, objects, landscape, weather and everything in between build in layers upon the basic structure of the environment. These are what help form a picture in the reader’s mind; the challenge is providing enough information so that the reader can form their own view, without saturating the text with descriptors. Find my other mind maps at the directory! I was always taught that when arranging your location, you should write about a ‘real’ area. This was something I had always struggled with as using my immediate location within my work just didnt flow for me. Now, I use the area in which i grew up, and am able to revisit and utilise things that seem to be more prevalent than where I am now. For example, I was trying to describe a neglected cottage. Looking at where I live now I couldn’t find anything especially distunguishable. returning to my location, i realised that a key sign of neglect was brambles. Simple. For some reason, this knowledge has helped me immensely and has allowed me to write without over description. The boxes labelled “real” and “modified” are referring to times in the past or present that have occurred. Real represents history as it occurred – locations and events. “Modified” is taking a location and then modifying it in some way to create a different setting. So in that way, you could easily find pictures and create a location from a “real” area even if you’ve never been there. Oh completely. Then to have your characters moving around you can get a bog standard street map to provide names of locations/street names. – I’m not tha clever though. I struggle as it is keeping up with my characters and plot without chucking in the creation of a place. Guess that is why I don’t write fantasy. I’ve posted an update to my site (writing tips update), linking to your Mind Map. I’ve also redrawn it using iMindMap to show how well your Mind Map represents the Mind Map Principles.